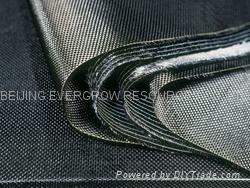 The viscose yarn(cloth) are converted into carbon fibre(cloth) by the special process of weaving, preoxidization, carbonization aftertreatment etc. It has the good high temperature resistance, corrosion resistance for many kinds of organic solvents, it is widely used in military,aerospace fields, and also as electric conductive and exothermic materials used in many industrial fields. 2. electric conductivel and exothermic materials.